LENTZ RESURGENT GRAINS embrace a cereal that helped lift the grand stones of the pyramids. That’s Egypt for you – while pharaohs and nobles dined on Emmer, the workmen thrived on Nile Barley. Our Black Nile Barley belongs to the ancient group of hulless, or “naked,” barleys, Hordeum vulgare nudum. Barley is a word from the Old English bere, which is also the root of barn that originally meant barley-house. Genetically simple, a diploid, barley was domesticated at the beginnings of farming in the Fertile Crescent, along with Einkorn and Emmer. 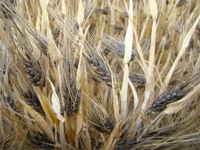 In Egypt barley became so important a staple that it was celebrated as a symbol of Upper Egypt. Wild barleys still grow in the Middle East today. Barley’s journey through the centuries has a lot to do with beer and whiskey. It’s no coincidence that Germany tops the world’s barley production (think: Bier!). In Scotland, too, barley is a major crop (Scotch! ); in fact, historians say that bere was Scotland’s staple long before wheats arrived. And bere wasn’t all drink, Scottish beremeal bannocks were breakfast fare for thousands of years. 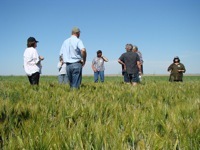 And of course barley was and is a major livestock feed. All Barleys are officially (FDA) Heart Healthy due to their beta-glucan that lowers blood cholesterol and reduces the glycemic index. Most folks don’t realize the extent of Barley recipe possibilities, since mainstream stores merely offer pearled barley product. But the maltose in Barley actually makes for fine flavor of Barley flour, with which you can bake just about anything short of rising bread. Our Black Nile Barley pancakes are the best in the world. The black – actually, deep purple – pigment of Black Nile Barley expresses high antioxidant levels of anthocyanin. Anthocyanin is also found in red beets and purple cabbage, albeit the antioxidants are said to be more stable in grain than in veggies. The hulless aspect of our Black Nile Barley is rather important. 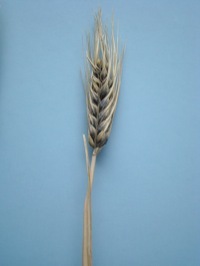 The hulled trait of barley is caused by a recessive gene; biologically this is the formation a cement-like substance that binds the hull to the kernel, beginning 16 days after pollination. This cement makes hulled barleys different from other hulled grains like Spelt, Emmer, Einkorn, in that removal of the barley hull must be by grinding (instead of dehulling); pearling barley is such a process. Conversely, our hulless barley requires no grinding, and so is a true whole-grain product, the bran and germ of the kernel intact after dehulling. Industrialization focused only on the two-row and six-row hulled barleys, while hulless barleys survived in Tibet and some African countries as important staple. The resurgence of hulless barleys in the western world today keeps in step with the demand for whole, healthy, strongly aromatic foods. The visual appeal of the black bran of Black Nile Barley delights chefs especially – we live in a world seeking color, whiteness be damned. That Black Nile Barley farming contributes to biodiversity, so much the better.